Date Added: Tuesday 26 March, 2019 by Sabrina M.
Date Added: Monday 11 March, 2019 by Brian W.
Date Added: Thursday 07 March, 2019 by James R.
This suit is the best purchase you could possibly make! Wether that be for normal use, or for a costume. I have been wanting this for many years now, and boy am I glad I bought it! The quality workmanship is second to none, the lining, stitching, everything is top-notch! Both Indy and his colleagues were more than helpful when it came to ordering (as I needed the suit before a particular date) and I have got weeks to spare before the date I gave them!! I have already ordered more products from them, and will continue to do so in the future :) 700/10 stars :).. 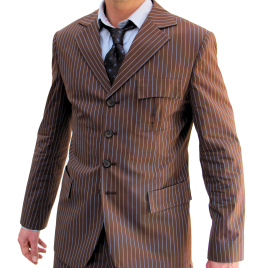 Date Added: Thursday 03 January, 2019 by Emmanuel T.
After having two fabric variations of the brown suit for a few months (Cotton and Wool), I highly recommend that this is the best suit for your Dr Who themed party / event. This also works as fantastic general office wear and is arguably more comfortable than normal office attire. (Tip: It is even better with Converse shoes!).. Date Added: Thursday 01 November, 2018 by Maverick H.
Got the suit in time for Halloween. Wore it on campus and alI got were compliments on how accurate it was. I ordered the new Navy with Rust stripes and I fell in love with it the second I opened the package. Fits like a dream and my only fear is that Iâ€™ll wear it too much. Anyone who wants to own an accurate Tenth Doctor Suit, this is it!!.. Date Added: Monday 30 July, 2018 by Paul R.